Ten Thousand Things brings their totally unique, stripped-down, bare-bones, get-right-to-the-core-of-it style to another Shakespeare play (one I've never seen or read), Measure for Measure. And they do it in a way that's fulfilling for everyone, from Shakespeare experts (like the people sitting behind me who noticed which lines were cut), to avid theater goes who still sometimes have a hard time getting into Shakespeare's world (like me), to the homeless people and prisoners that comprise TTT's non-traditional theater audience. It's in the way the actors clearly and slowly say the words, with emphasis in the right places to make it more understandable; the humor and lightness they bring to certain moments in the play; the interaction and eye contact with the audience; the playful sounds (from Peter Vitale) that set the tone and highlight certain actions; and the simple but entirely appropriate set pieces and costumes. All of it adds up to really great storytelling, which is what theater is all about, no matter who the audience is. I did not know that Measure for Measure was a comedy until I read the Wikipedia page. It definitely has comedic moments and the trademark disguises and mistaken identities, but it doesn't have that light-hearted slapstick feel of many of Shakespeare's comedies (it's known as a "problem play" because it doesn't easily fit into one category). The undertone is a bit darker, as it deals with issues of justice, judgement, and mercy. The plot concerns a man named Claudio who is sentenced to death for "fornication" with a woman whom he considers his wife, although the law doesn't. Claudio's sister Isabella, who's about to become a nun, pleads with Angelo, the man who sentenced Claudio, for her brother's life. Angelo agrees to spare Claudio if Isabella sleeps with him, the very act for which Claudio is condemned. Fortunately there is someone observing this mess and plotting to make it right - the absent Duke, who is in disguise as a Friar. Things eventually work out in the end, which is I guess how you know it's a comedy (in Shakespeare's tragedies half the characters end up dead). To summarize, it's like the TV show Undercover Boss, as observed by a homeless man who was in the audience at one of the shelters where TTT performed. The Duke, the boss of Vienna, is observing her subjects in disguise and righting their wrongs. As usual, TTT found some of the best actors in the Twin Cities for this play. Suzanne Warmanen is wonderful as the Duke, bringing an interesting perspective re-imagining the all-powerful ruler as a woman. Luverne Siefert is his usual clownish self (I mean that as a complement) as Pompey, but there's nothing funny about his portrayal of the deadly serious Angelo. Sonja Parks brings dignity and power to her role as Isabella, despite her tiny frame. A couple of students from the U of M/Guthrie BFA program really shine - India Gurley in a variety of roles, and the utterly charming Nathan Barlow as the accused Claudio and the goofy cop Elbow. Karen Wiese-Thompson is funny as the town prostitute, and sympathetic as Angelo's rejected betrothed. Kurt Kwan is solid as a soldier, a friar, and the exasperated prison provost who helplessly watches the events play out, and Zach Curtis is a range of funny as simple-minded Froth, the well-meaning Lucio who puts his foot in his mouth, and the prisoner who's too drunk to be executed. 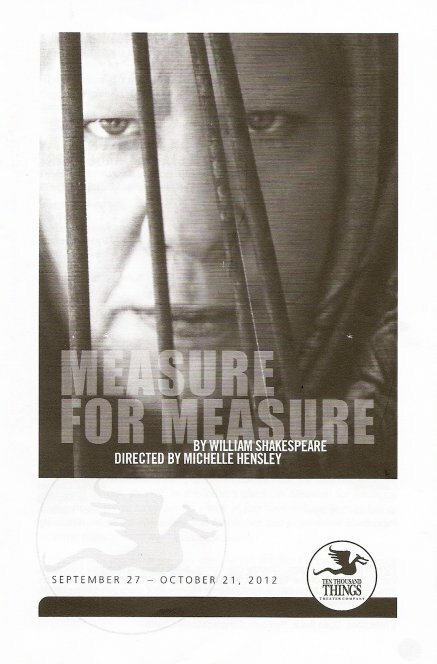 Ten Thousand Thing's Artistic Director Michelle Hensley, who directs this piece, also directed Measure for Measure for The Public Theater in NYC a few years ago, and they are continuing the idea of performing for free to atypical theater audiences in the community. I've said this before and I'll say it again - if you've never seen a Ten Thousand Things production, you must go. It's truly unlike any other theater you'll see anywhere, and once you get a taste, you'll be hooked like I am.